Last week, Luna joined a cooking class with renowned Japanese cooking sensei (teacher), Chisato Kamegi. Due to the popularity of her class, Luna and her friends had to reserve their seats a few months prior. 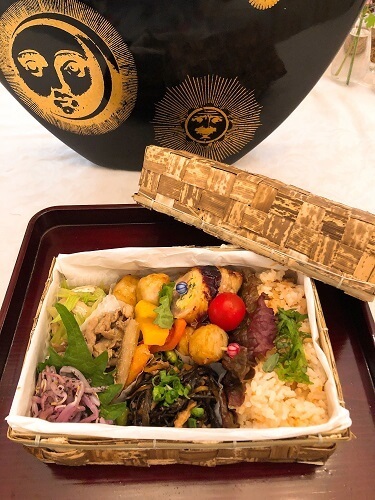 As hanami (cherry-blossom viewing) has arrived in Osaka, Luna and her friends learned the art of making bento boxes to take on a hanami picnic! 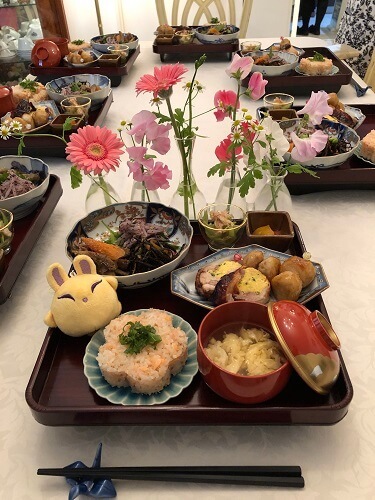 Everything looked stunning and of course, the taste was also oishii! If you’re now hungry and craving bento, you can make your own! You can be creative making your bento for yourself, or for your loved ones. tamagoyaki (Japanese rolled omelet) *Luna’s favorite! 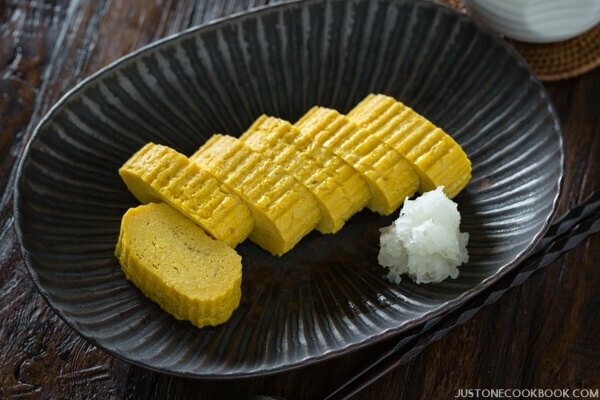 The taste of tamagoyaki differs in each family home, like miso soup. Some families love sweet tamagoyaki and the others like it salty. It is a very simple dish, but there is an art to it! Let’s make Luna’s favorite, tamagoyaki. The sweet tamagoyaki recipe is recommended for bento, as it contains sugar and therefore will last longer before it goes bad. *For the salty tamagoyaki, adjust the ingredients slightly to ½ teaspoon of sugar and ¼ teaspoon of salt. A tamagoyaki pan - if you don't have one, a regular pan is fine! Beat the eggs with a fork or chopsticks, add the salt and continue beating. Mix in the mirin, sugar and soy sauce. Heat up a square tamagoyaki pan (you can order through Zenmarket). 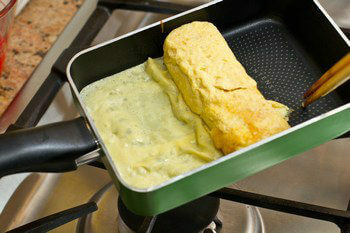 You can still make tamagoyaki with a regular pan, but it can be difficult to fold and roll the omelet. Heat the pan over a medium flame and add oil. Make sure to heat the pan, as the oil moves quicker when heater and this is very important. Spread the oil, then pour in about ¼ of the egg mixture. Tilt the pan to spread a thin layer of egg evenly over the pan and then let it cook until the egg is no longer runny. Gently begin rolling the egg from one end of the pan using a spatula. Roll it as tight as possible so that there are no air bubbles inside. Add a bit more oil to the pan and then pour in more of the egg mixture, lifting up the rolled egg and making sure the egg mixture gets underneath it. When this new layer is cooked, repeat step 6 and keep going until all your egg mixture is finished. When making bento, make sure you prepare and store the food properly so it won’t go bad. What do you want to cook with Luna?! Let us know!